An AdWords manager account (MCC) is a powerful tool for handling multiple AdWords accounts. Manager accounts allow users to link several accounts so they can be viewed in a single location, and are frequently used by third-party advertisers such as agencies and marketing professionals. 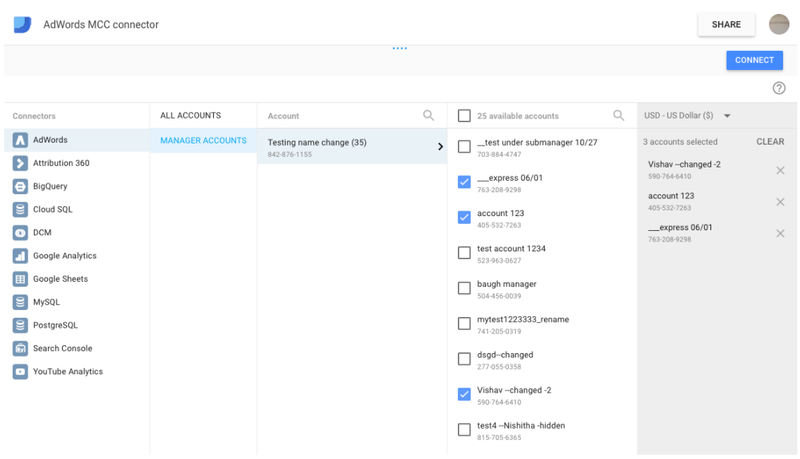 Today the Data Studio team is releasing an enhanced AdWords connector, giving users the ability to select MCC sub-accounts and set up reports for accounts containing multiple sub-account currencies. 1. Selecting sub-accounts: prior to this release it was only possible to connect to an entire MCC account as the data source for a Data Studio report. This enhancement allows users to define a data source by selecting up to 75 individual sub-accounts within an MCC account. 2. Filtering on currencies: one common challenge with MCC accounts occurs when sub-accounts are set to different currencies. While metrics such as impressions and clicks can be aggregated correctly across these sub-accounts, currency fields like Cost and Average CPC cannot. The enhanced AdWords connector allows MCC account holders to filter sub-accounts by currency to avoid this problem, and removes currency fields from the connector if multiple currencies are present. To connect to MCC accounts, create a new Data Studio data source and select the AdWords connector. If you have access to an MCC account, a “MANAGER ACCOUNTS” option will appear. The account holder can then select sub-accounts they are interested in, or use the pull-down menu in the upper-right corner to filter for sub-account currencies. Note that existing Data Studio connections to MCC accounts must be edited and reconnected or recreated from scratch to take advantage of the new enhancements. Your feedback and questions is welcomed in the Data Studio community forums.